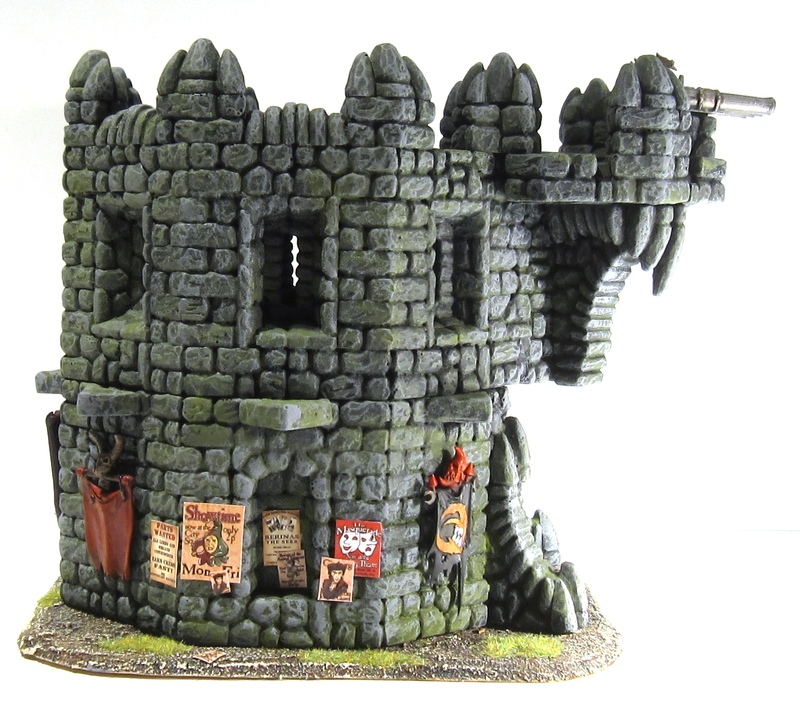 The Mordheim skirmish game is one of those iconic pieces of the Warhammer world. While the rules are woefully out of date, the imagery of small bands of scavengers fighting over the ruins of a once proud imperial city is enough to make the game exciting. At least if one has such ruins on hand. 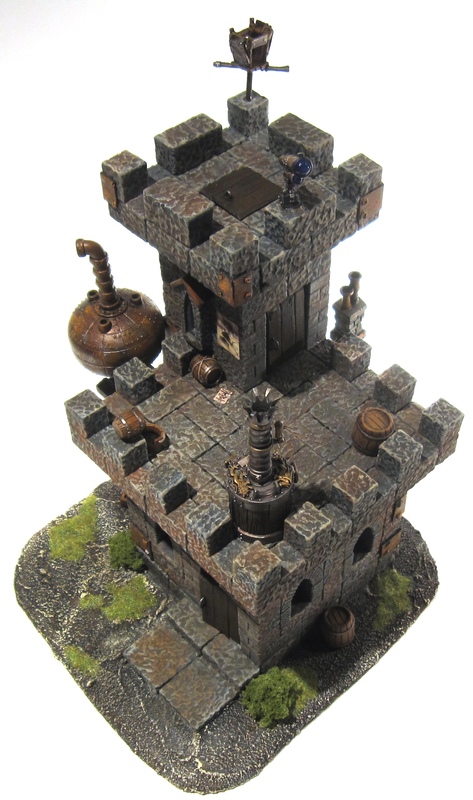 I am slowly building a modular collection of Mordheim terrain and am about halfway towards the goal of a full 4’x4’ table. Most of the buildings in the collection are residential ruins made from wood and plaster. Augmenting these are some special buildings that either corresponding to particular features of a medieval city or have a bit of narrative attached to them. More often than not, these buildings are made from fieldstone or brick. Some of them are still in more or less intact condition to emphasis their “stony” nature. All the buildings are based on dirty and mud. 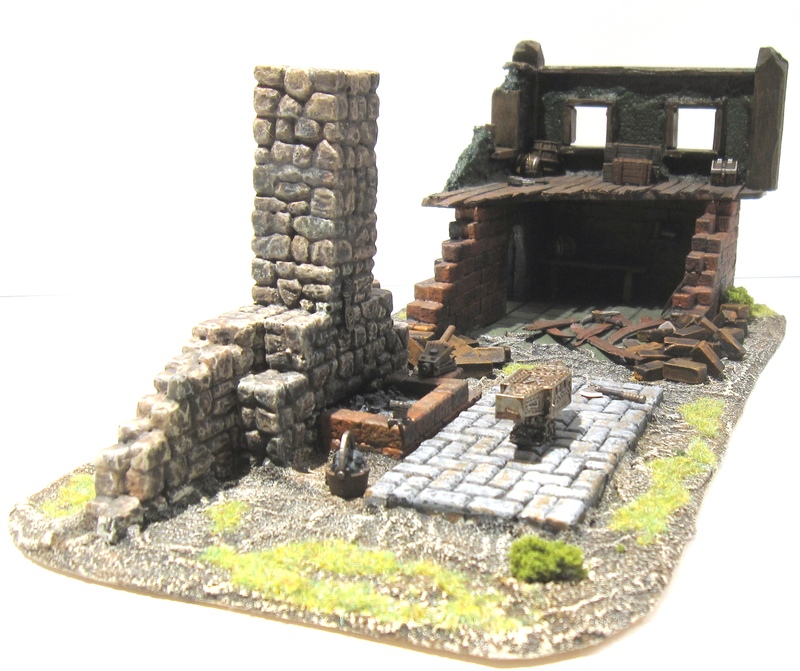 Some hobbyists prefer stone paving for their Mordheim boards but I’ve always considered Mordheim more of an overgrown medieval village and thus find dirt more appropriate. 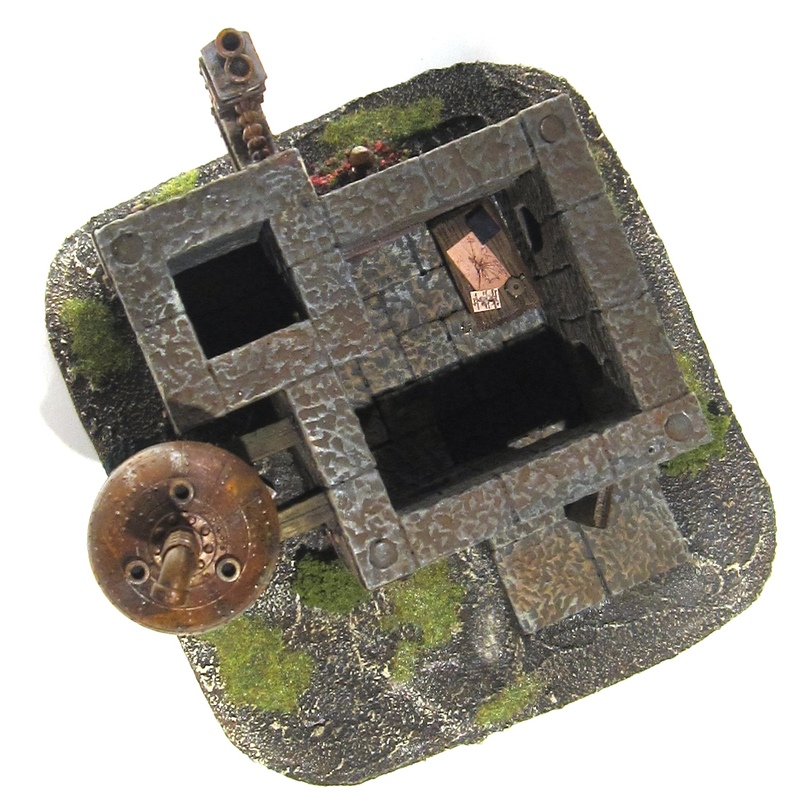 I will slowly add finished buildings to this site as they come off the factory line so to speak. A description of the fabrication process can be found in the Tutorial section. The Market is a mild parody on all those roleplaying computer games where each village has a store for weapons, magic, priestly goods, and adventuring supplies – but no grocer or butcher can be found anywhere in the world. 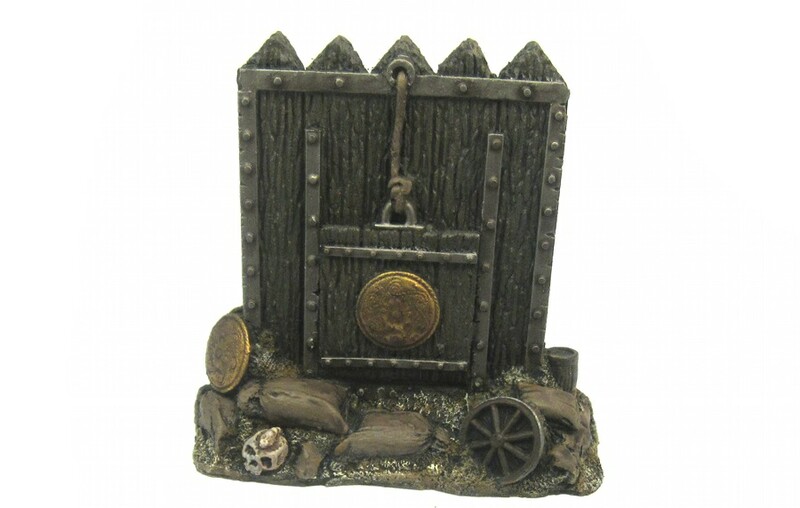 Thus, the market has four little iconic trade booths: Thorgrim’s Dwarven Steel, The Magik Shoppe, Sigmar’s Temple, and Thy Fine Adventuring Goods. 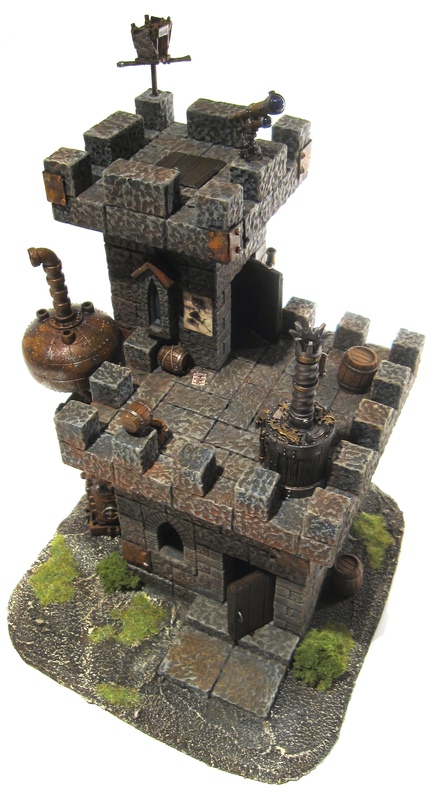 The motives and decorations of the weapon store match those of Thorgrim’s Smithy, another specialty building in the collection. These little narratives help to turn a random game board into a real city section. The buildings and floor was made from Hirst Art bricks. The temple roof is cardboard while the other ones are Hirst or Linka casts. The detail pieces are from bits box and are meant to illustrate the character of each store (e.g. wizard accessories, etc.). The furniture is made from balsa wood. Even though the model is fairly crowded, it is fully playable. 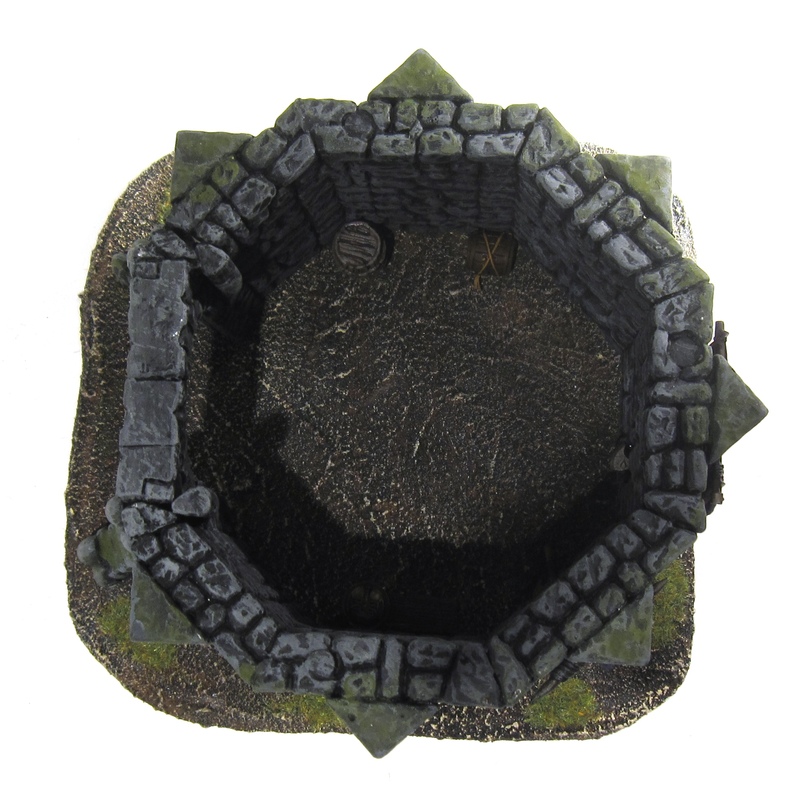 All four roofs are magnetised and removable as seen in one of the pictures. Similarly, the three tables can be removed to enable easier access. The interior of each booth is also decorated, including a few canvas paintings/carpets. I make these by printing custom imagery onto canvas paper and then using washes to blend/age them a bit (depending on the status of the building). The bell tower is a standard Hirst Art template construction. The eight statues are old imperial Reiksguard knights painted up as copper with a heavy coat of verdigris. The stained glass windows are simply printed transparencies with an appropriate rosette motive. 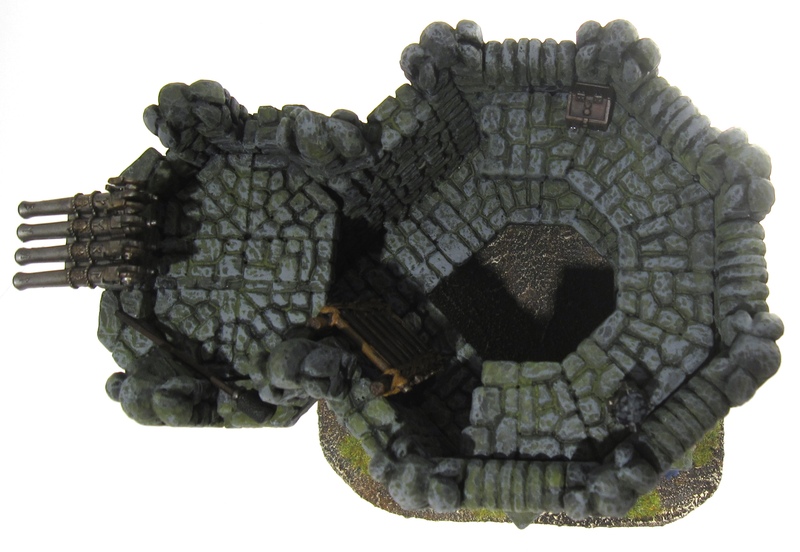 The building can be separated into two vertical halves to allow access during gameplay (fully magnetised). 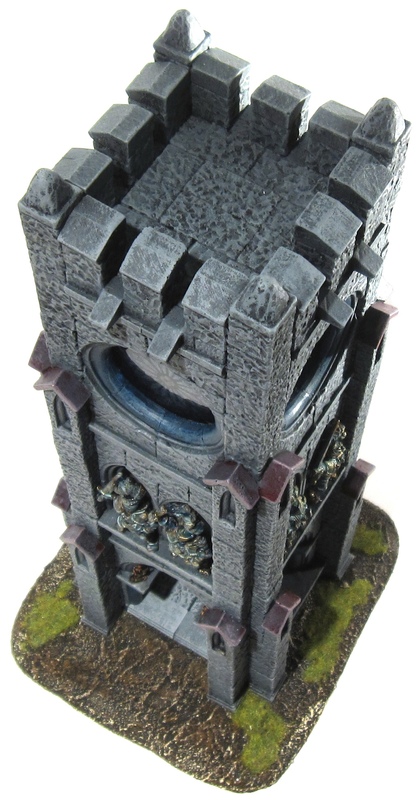 Special scenario rules for the tower allow it to collapse if too many models are on top. For this purpose I have a collapsed bell tower model which is awaiting final painting touches. 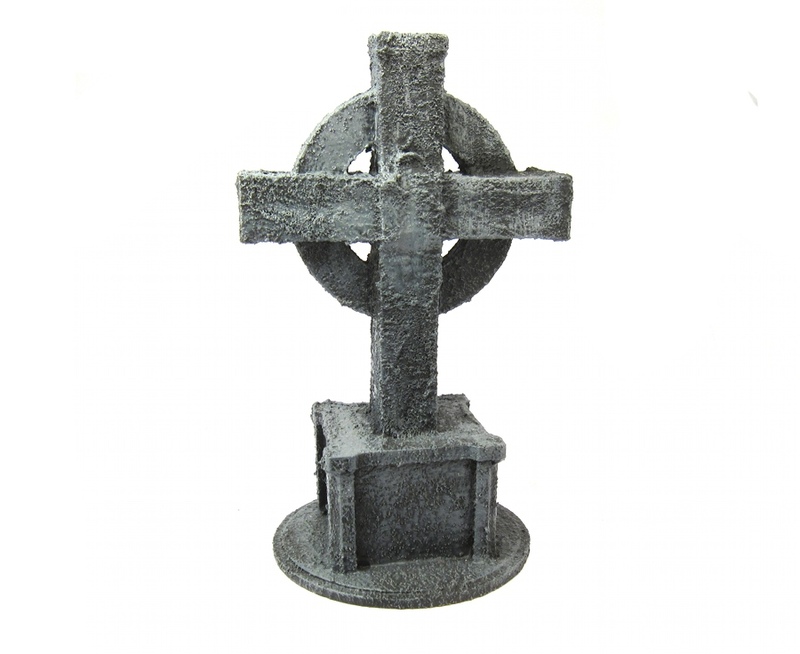 A very simple piece made from some leftover Hirst Art dungeon pieces and a very old Warhammer wizard painted up as a bronze statue. 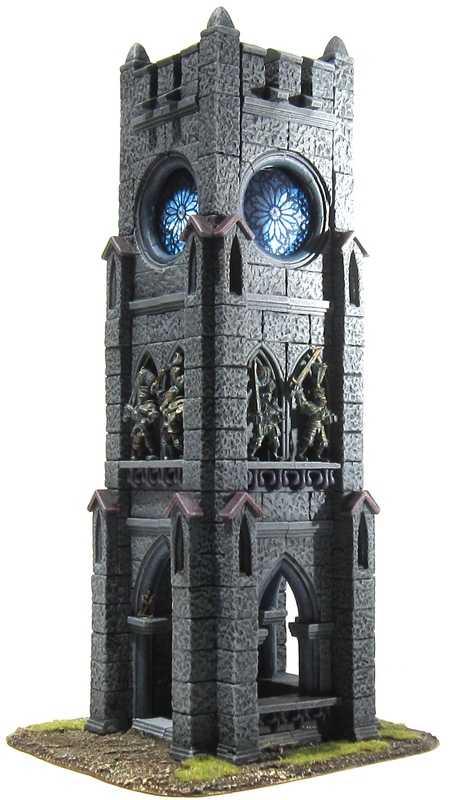 The Tower of the Mad Scientist is based on the Hirst Art Wizard Tower design. I modified it a bit with various pieces of Warhammer and Platformer parts. The doors are fully hinged and the top comes off for interior access. Like all buildings, the top is held on by magnets embedded in the UltraCal blocks. The Smithy is the workplace that uses to support the Thorgrim’s Dwarven Steel store on the Market place (above). At least that’s the theme I was trying to carry across. 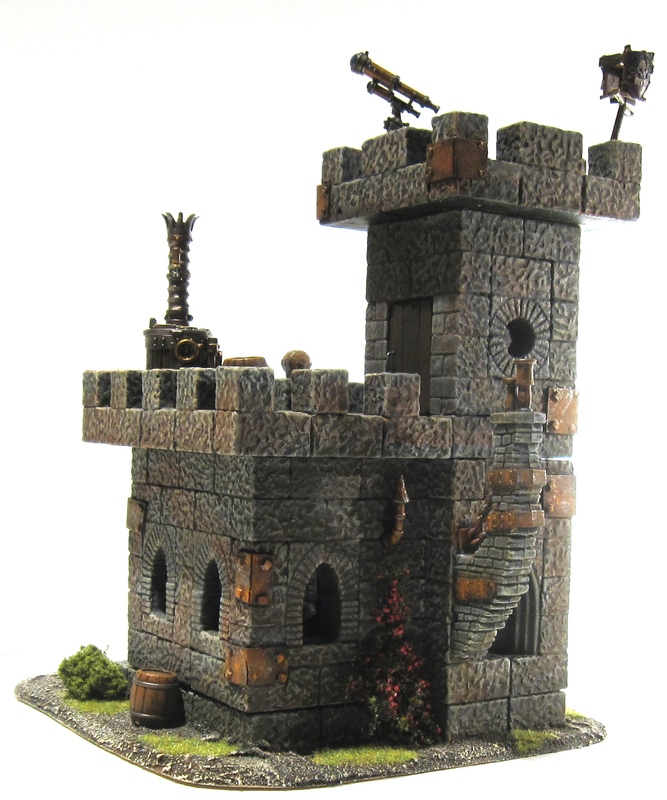 The model is a mix of brick, fieldstone and plaster construction with some Warhammer bitz thrown in for detail. The detailing matches the Weapons Shoppe so hopefully that creates the visual connection. 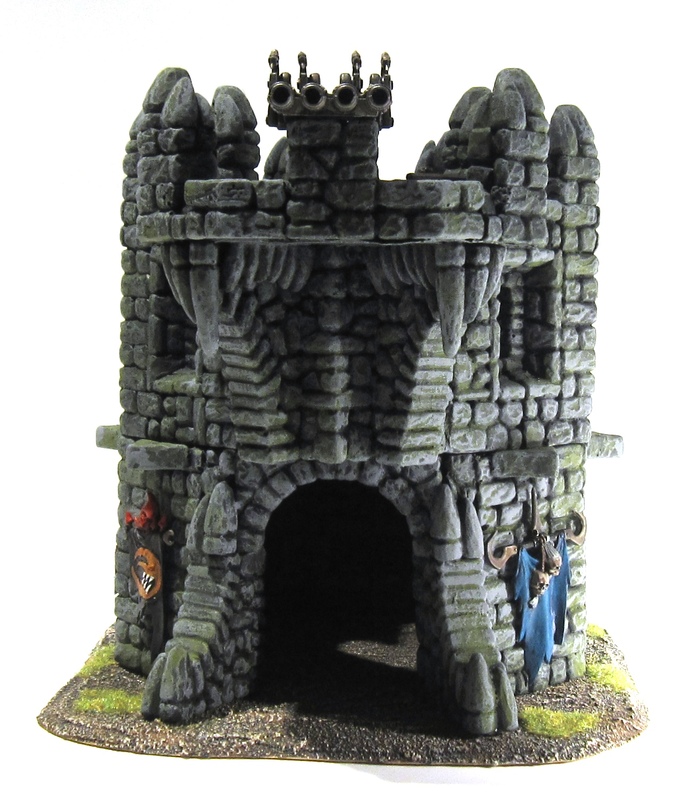 The Bastion is yet another Hirst Art design called the Octagonal Fieldstone Tower. I modified the design of the firing slots a little bit and added a mighty organ gun on top of the gate. 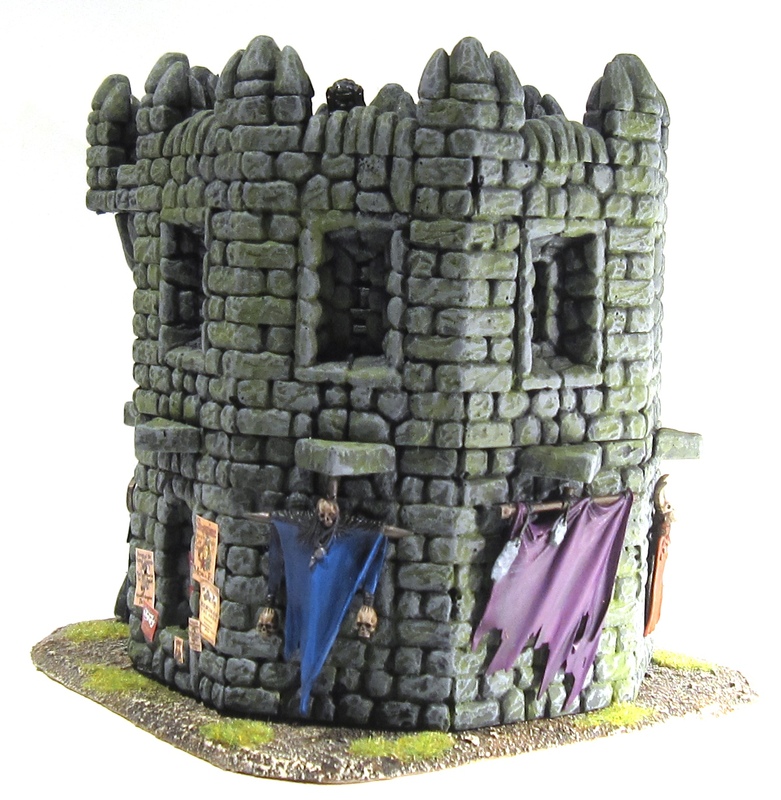 That should deter the mob… The top floor can be removed and the little half-floor comes out as well (all magnetised). 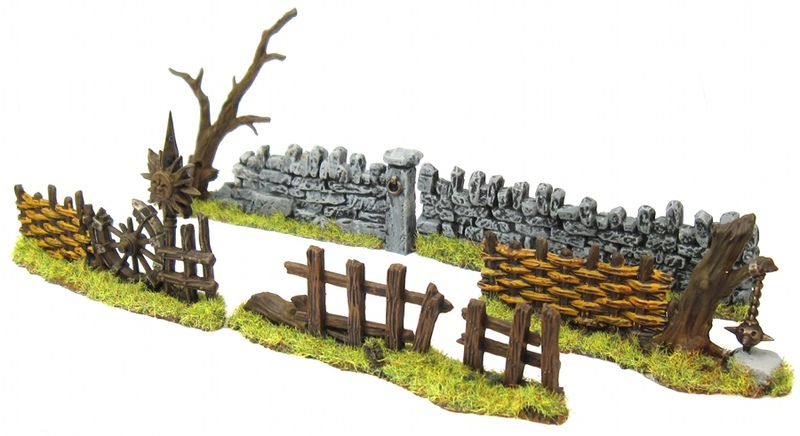 Made from Hirst Arts stones, the bridge spans the river in my terrain boards (both grassland boards and the “mud/ruins” boards that I use for Mordheim. 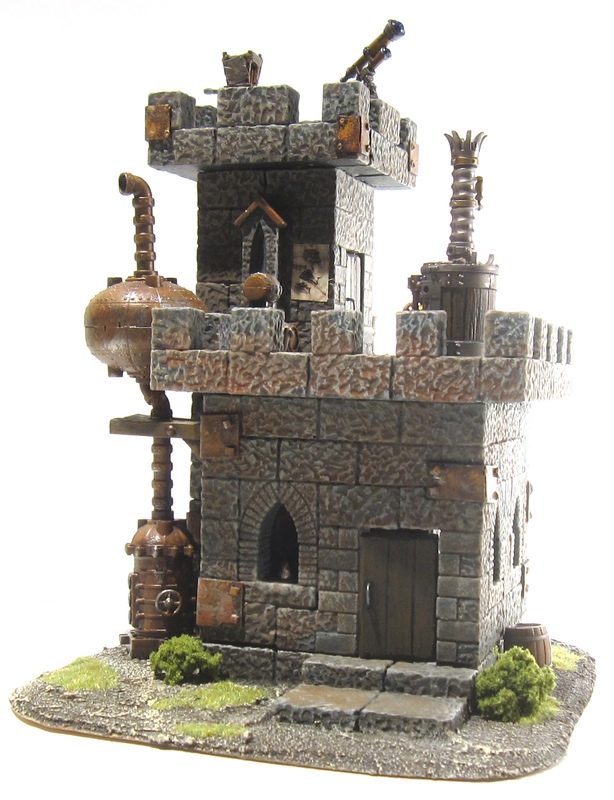 This model was inspired by the classic building in the original Mordheim release images. The arches are from Hirst Arts bricks and the upper structure is the usual balsa and foamboard mix. Another brick and wood composite building. 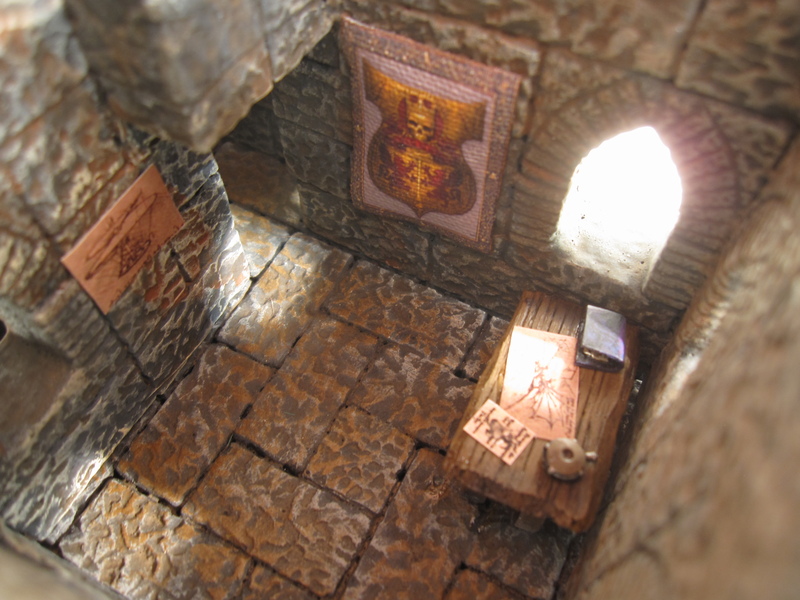 This one hides a cultist altar in the basement! The streets of Mordheim are littered with smaller constructions, piles of debris and other sources of cover for our valiant heroes. 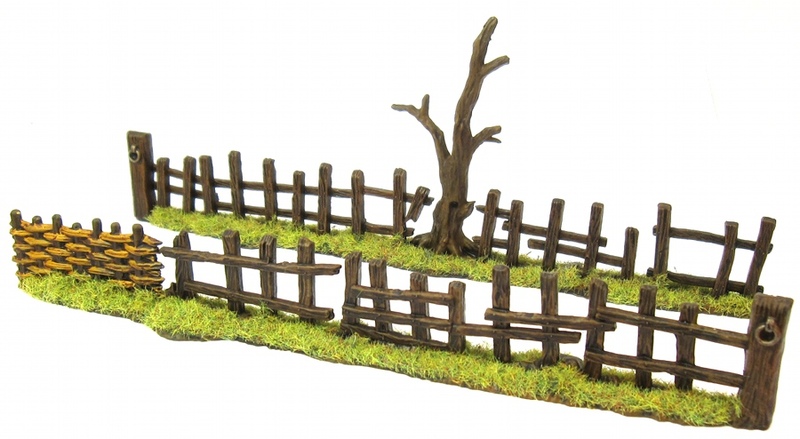 Below is a collection of such items to add detail to the battlefield. Some of these are resin or plastic, some scratchbuild. 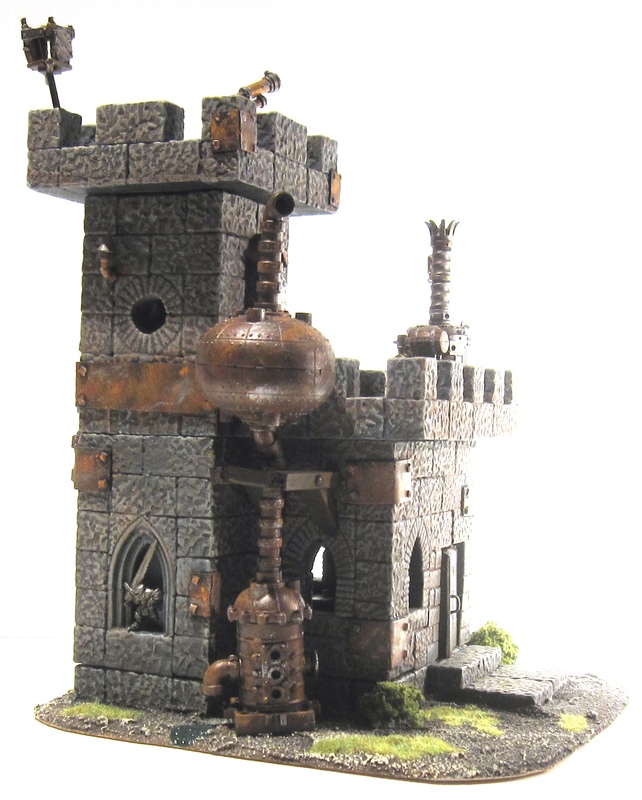 Your scratch-built pieces of terrain are really well done, with so much character and life!